For the latest info on my upcoming events, follow me on Facebook. 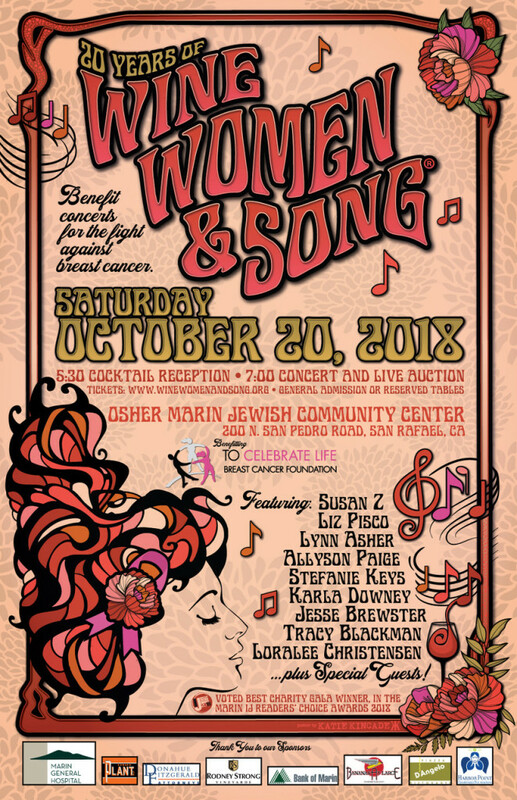 Join us October 20 for Wine, Women & Song 2018! Wow! I am overjoyed that Wine, Women & Song® is celebrating 20 years of benefit concerts! WW&S has produced over 40 shows since 1998, with the help of many dedicated friends and volunteers, most recently Harbor Point Charitable Foundation. Together, we have raised over $350,000! This year’s show will feature Liz Pisco, Lynn Asher, Tracy Blackman, Stefanie Keys, Loralee Christensen, Allyson Paige, Karla Downey, Jesse Brewster and Susan Z. Once again our theme is “music by people who have been affected by breast cancer”. So mark your calendar for October 20 and join us for a rollicking fun evening of fundraising and dancing! Thanks to your generous contributions, we won five hours of recording time at Fantasy Studios! To read all about the the Oh Say, Can You Sing contest winners, visit this page on the Bread & Roses site. Susan Z is a multi-talented singer-songwriter, actress, children's performer and founder of Wine, Women & Song, the annual Marin breast cancer benefit.